I think we all have those days where we get stressed even over the smallest of things! Over the last couple of weeks for me this has been a constant feeling and I have had to find ways to take my mind off of things even for just an hour. 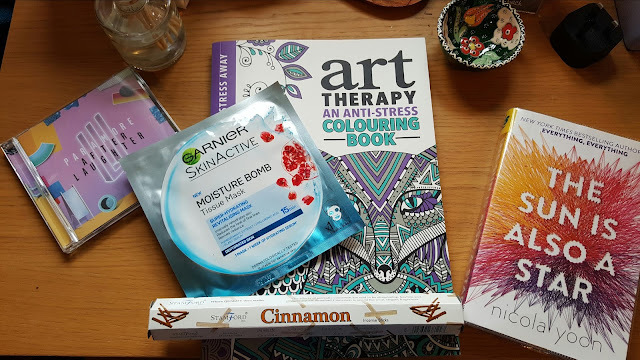 I thought I would share with you some of the things that help me relax when I'm stressed. The ultimate de-stressor is definitely listening to music. I've been overly relating and obsessing over the new Paramore album this last week. Sitting down and painting your nails or putting on a face mask makes me feel so much better. You can't beat a good pamper sesh. There is definitely something relaxing about these anti-depressant colouring books, taking half an hour and just focusing on the page and what you're colouring. This is a recent discovery for me. On a recent trip to Barmouth I bought some lovely smelling incense sticks, I find the aromas incredibly calming and relaxing, the scents are much more powerful than a candle. Getting lost in a good book always helps take my mind off things! I am currently reading The Sun is Also a Star by Nicola Yoon. These are the ways that I de-stress after a particularly bad day or week. What helps you relax when you're stressed? Colouring is definitely a good way of relieving stress, I guess any kind of art is :). Reading is great at taking your mind off things, especially if it's a good novel.